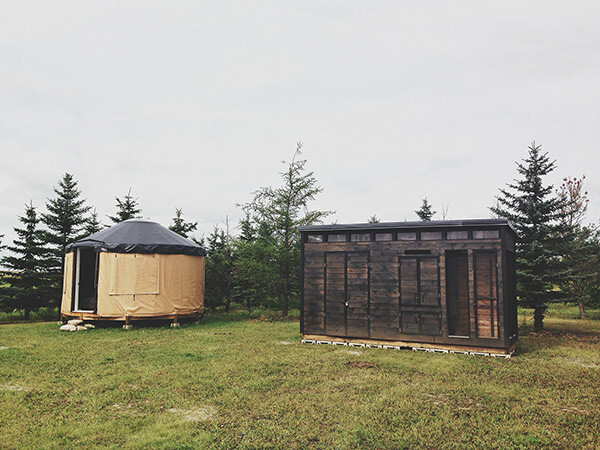 When we purchased the land, one of our first thoughts after the excitement of closing the deal was… “Crap, what are we going to do with our chicken coop/shed.” I’d spent a ton of time on it, too much money, and plus it was just way too awesome to leave behind. I started to look into our options. I made a few phone calls to some moving companies and eventually found one that was willing to come by and take a look at it for us. My original thought was to hire a picker truck and flat bed trailer. I was told the cost would be $350/hour. Ouch. But if that’s what it took, then so be it. They had their operator come by and take a look at it for me. “Ha, not a chance, buddy,” were his first words to me. I felt deflated. With the power lines overhead he would not be able to lift it and to get a truck and winch in there simply wasn’t enough clearance in the back lane to drag the coop out and onto the truck bed. Double crap. “Ok, is there anything else we can do?” I begged him. “What is this thing anyway?” He asked. 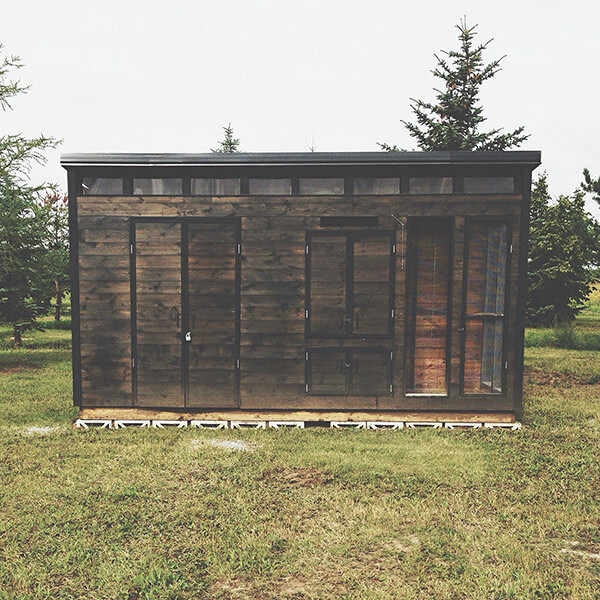 “Uh, it’s a shed and uh, a chicken coop.” (At this time we had not been publicizing our illegal activity). 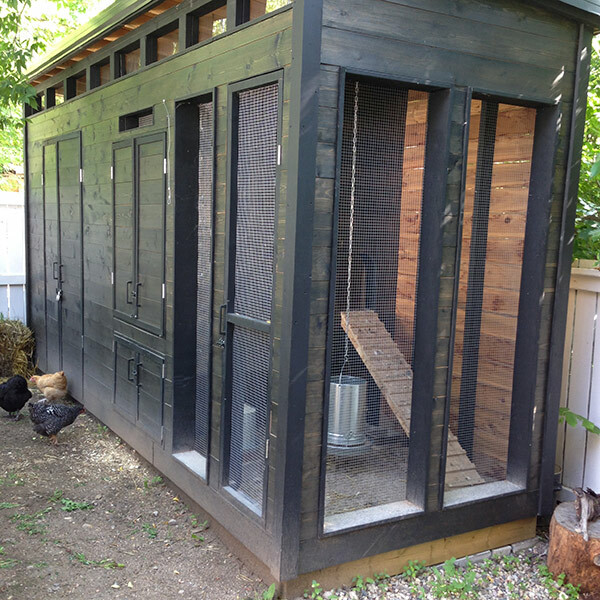 “You have chickens in the city?? Right on, man!” He told me that he raised free-range organic chickens just outside city. I didn’t even have to ask him where his farm was, I had an overwhelming sense that I just knew. “It’s just near Pike Lake,” he said. Ha, I knew it! “That’s where we are too!” I said. I explained our location and he was familiar with it. From that point on he was way more motivated to help us out. “Ok, let’s figure this out,” he pondered. 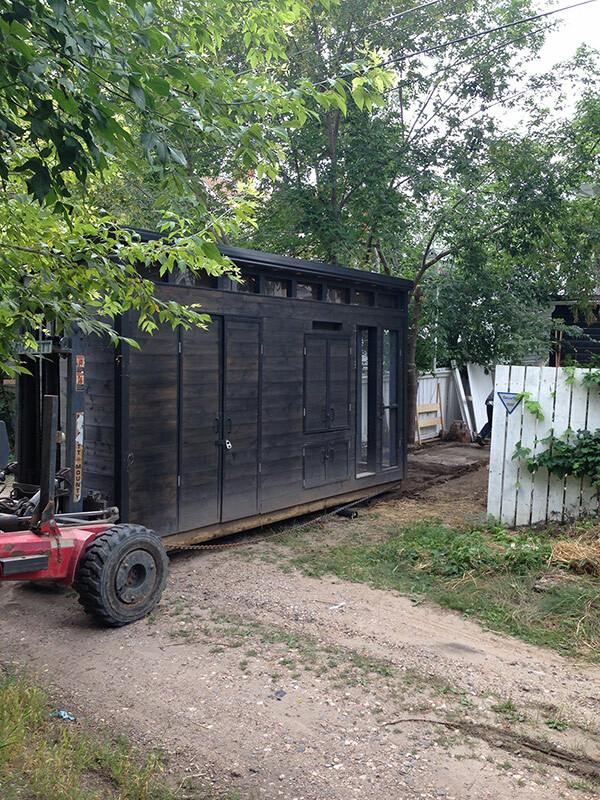 He explained that he could perhaps get a big forklift, slide it under the back, wrap the coop/shed in chains, drag it out, then come around to the front, lift it up with the forklift, turn 90°, drive down the alley, and place it onto a flatbed trailer. All of this sounded terrifying and dangerous. But we had no other options. “It’ll definitely be one of my toughest moves,” he said, “But I’m 90% sure it’ll work.” Also it was a lot cheaper that $350/hour. We set a date for two weeks from then. During that time, Darcie and I found a spot and laid down cindercrete blocks that I salvaged from my buddy’s retaining wall that he was tearing down. The next weekend, we slaved like prisoner’s on hard labour (perhaps paying penance for our illegal city chickens? ), breaking the ground and laying and levelling the bricks. D-Day finally came. 9am Saturday he would be there. At 9:20 I heard some heavy machinery rolling up the alley. It’s go time. We’d had a friend come by and take apart the fence (as I was still lamed up because of having my face jackhammered in surgery the week before). 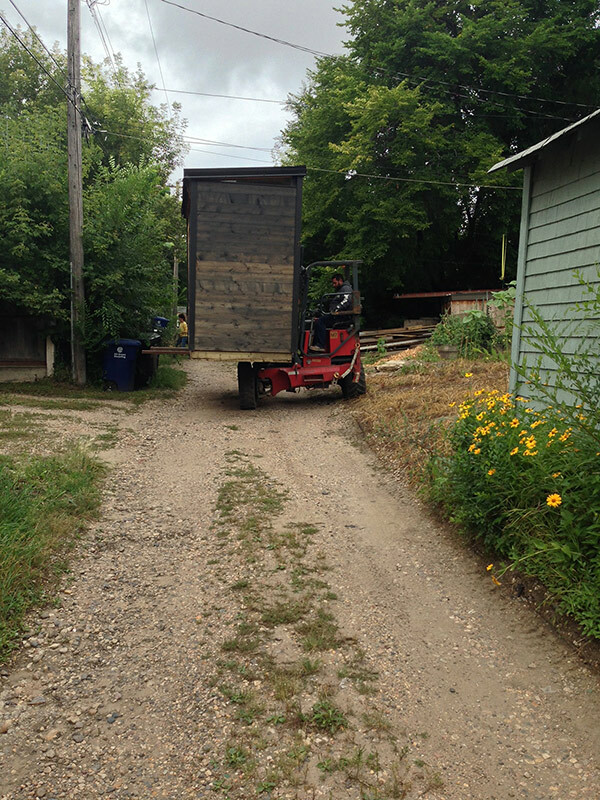 He brought the forklift around and gently slid it under the back of the coop/shed. It went, really, just like he explained, only smoother. I was so impressed. 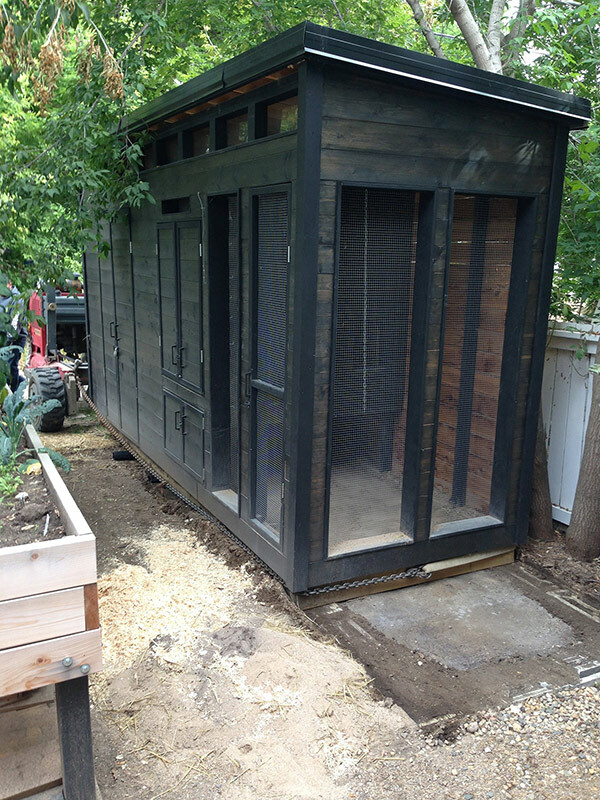 I had totally expected the coop to just disintegrate or at the least to break in two as he lifted and dragged it, but it held together and in the end there was not a nick or scratch on it. We drove out to the property with him following us. 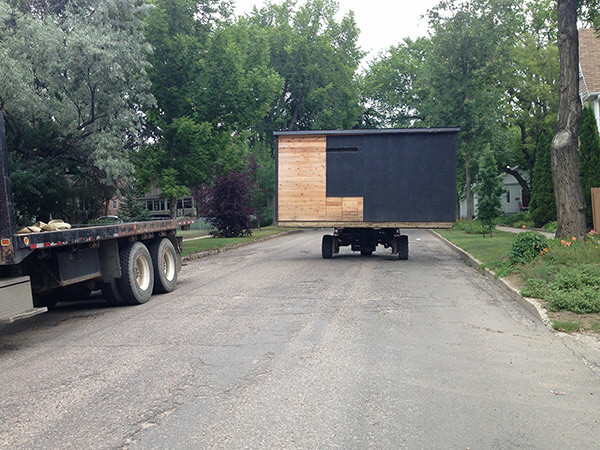 It was so exciting to see the coop being hauled down the road like that. Then it was onto the easy part. He lifted the coop/shed off and placed it gently on the foundation we’d made. Done. OMG, that was awesome.